A solenoid behaves like a magnet during the flow of electric current through it. This is known as electromagnet. A solenoid is made by winding a length of insulated wire around a magnetic material such as iron bar. In the figure, a long copper wire insulated is wound around an iron bar. The two ends of the wire are joined with key and battery. Switch on the key and bring some pins near one end of the iron bar. These pins are attracted, if the key is switched off, no current flows in the circuit and pins fall immediately. It behaves as temporary magnet. Current through the insulated wire. Number of turns of insulated wire. Distance between two opposite poles. It is a temporary magnet. Its magnetic strength can be altered. Its poles can be reversed. It can be very powerful too. It does not demagnetize by its storage for a long time. It is used in electrical device such as loudspeaker, radio, television and electrical bells. It is used in industries for lifting and transporting steel plates, girders, scrap iron, etc. It is used to separate magnetic substance from the mixture. It is used to remove magnetic substance from the eye. Electric bell is a source of sound that converts electrical energy into kinetic energy and then sound energy. An electric bell consists of a U-shaped soft iron core around which an insulated wire is wound to make it an electromagnet. It’s one end is fixed, while the other end is connected with a hammer which is free to move. When the key is closed, the electromagnet attracts the armature. Due to this, the hammer strikes the gong and the bell rings. As soon as the armature is pulled by the electromagnet, current in the circuit is automatically switched off. This is because the circuit gets broken at the point x. In this situation, the electromagnet loses its magnetism and it no longer attracts the armature thus the armature returns to its original position. When armature returns to its original position again the circuit is completed and current flows in the circuit. The cycle is repeated again and again the bell till the switch is on. A solenoid is made by winding a length of insulated wire around a magnetic material such as iron bar. Electric bell is a source of sound that converts electrical energy into kinetic energy and then sound energy. Electromagnet -What is it ? What is electromagnet? How can you increase the strength of electromagnet? What are the characteristics of electromagnets? What are the applications of an electromagnet? It can be used in various electric devices such as loudspeaker, electric gong etc. It can be used to separate magnetic materials from a mixture. Why increasing number of turns of wire in an electromagnet increases its strength? 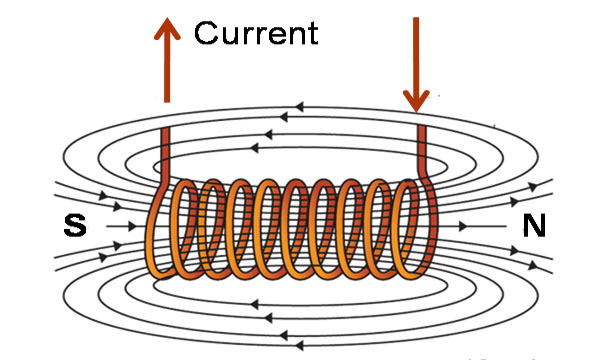 With increasing number of turns current flow in the solenoid (electromagnet) increases. Due to increase current flow, higher magnetic lines of force are generated. So, increasing number of turns of wire in an electromagnet increases its strength. The strength of magnet is depends on which factors? Electric bell is a source of sound that converts electrical energy into ______. Solenoid is made by winding a length of insulated wire around a magnetic material such as ______. Any Questions on 'Electromagnet '?